alaTest a collecté et analysé 32 avis de consommateurs et d'experts pour le produit Flip Mino HD II 8GB. La note moyenne du produit est 4.4 sur 5, tandis que les autres Caméscopes ont une note moyenne de 4.0 sur 5. Les testeurs apprécient le rapport qualité/prix. La qualité d'image impressionne, mais les auteurs d'avis sont moins positifs sur les performances de la batterie. 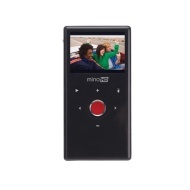 Après analyse des notes de consommateurs et d'experts, de l'âge du produit ainsi que d'autres facteurs, et comparé aux autres Caméscopes, le Flip Mino HD II 8GB obtient un alaScore™ de 80/100 = Très Bien. It's a brilliant, compact camcorder and I wish we'd discovered it earlier. Power-Up is excellent, takes just two seconds! Good Video Quality, Clear Sound Pickup! Easy to use, small and light weight. Soft wear installed from camera, no disc to load. Easy to share photos and video with facebook, you tube or by email. At present case for camera which is extra, is not very durable. Soft case included with camera is to thin to protect screen. Very easy to use and build quality is great. Need a good level of light to capture high quality recording. Simple to use,good quality images,many good features like being able to take a picture from video. Would like battery life to be longer. Battery inbuilt would not be able to replace without sending back to company. I think the Flip is an excellent product and this is the 2nd one I have purchased after giving the first one to my daughter. Picture quality and sound very good. Easy to use but difficult to use with computer. Pocket size and looks like a mobile phone so great to carry around.